Science with infants and toddlers? You’re doing it already! We often encourage children to be scientists. We ask open-ended questions to encourage the children to hypothesize. We ask children to predict outcomes and graph responses. But some teachers struggle with science, thinking of their own experiences dissecting worms or experimenting with magnets. But science is everywhere! And it’s appropriate for every age group, even infants and toddlers. 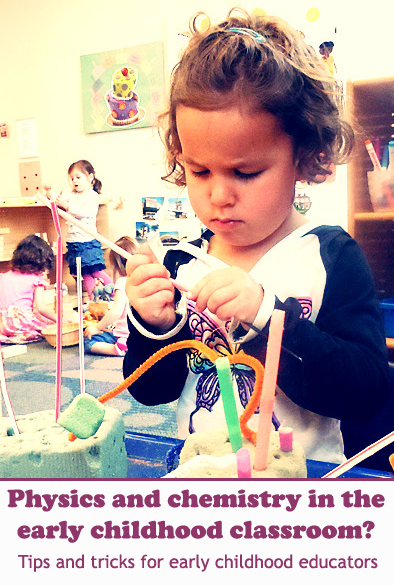 I get super excited when thinking about science in early childhood. Physics and chemistry aren’t just topics for high school. With infants and toddlers, physics is all about the basics: how can I make the ball move? Can I roll it with my hands? If I put this block at an angle, will the car roll down? I want to get on the slide. How do I move the other child to make room for me? And we’re doing chemistry with infants and toddlers every day. If physics is how to make something move, chemistry is about how to make something change. When working with play dough, how can I make it flat? When feeding myself food, what happens when I mix the mashed potatoes with the applesauce? Science is more than dissection and magnets. It can be as simple as rolling a ball or as complex as a cooking experiment. It can also be about exploring what is unfamiliar. Once when I was observing in a classroom, a child came over to me and started touching my arms, face and hair. Soon, more children came over. The teachers looked a little nervous but I assured them it was okay for the children to explore. Because I looked different than the teachers the children saw every day, they were curious. This is science. Even though the children were not verbalizing their thoughts, I can imagine they were hypothesizing what my hair felt like. They may have been comparing the feeling to past experiences. They may have been thinking this does not feel like my teacher’s hair. By allowing children to explore we are encouraging children to think beyond their current knowledge. Simply by rolling a ball, exploring new foods (or new people! ), we are inspiring scientific thinking that will help them their whole life. 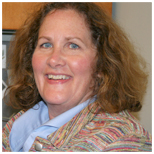 This entry was posted in Early Childhood, Infants and Toddlers and tagged child care, child development, children, early childhood, education, infants, science, STEM, teachers, toddlers on March 20, 2013 by Christine Fields. In a recent conversation with a child care provider, she asked me my thoughts on taking off a child’s shirt if he or she is eating a messy food, like spaghetti. Many parents don’t like when their child comes home with a messy shirt, and many child care providers naturally want to keep parents as happy as their children! Despite this possible conflict, I have to say that taking off a child’s shirt while they are eating is not the most appropriate solution to the problem. Meal times are such a special time for young children. 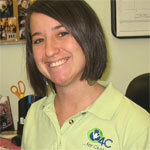 They meet children’s physical needs, but they are also a great time to address a child’s social and emotional needs. Very young children, including infants, need to be treated with respect. It can be easy to treat infants and toddlers as individuals who are “becoming” someone who has preferences, moods and thoughts but really, infants and toddlers already have and feel all of these things. How would you feel if you had to take your shirt off every time you ate a meal? You might not want to do it in front of other people, and very young children deserve that same privacy. We can’t expect an infant to enjoy meal times and get the most out of the experience if he or she is uncomfortable. Mealtime should be a sociable, happy time. It might not seem like it’s that simple, especially when it’s easier for us to take their shirt off and save the time cleaning them up, or explaining to mom or dad where that huge, mysterious stain came from. But what’s easier for us isn’t a good enough reason. When a child is first learning to feed themselves, it can get quite messy, especially when they are moving past finger foods. At that point, it would most definitely be easier to feed them ourselves. 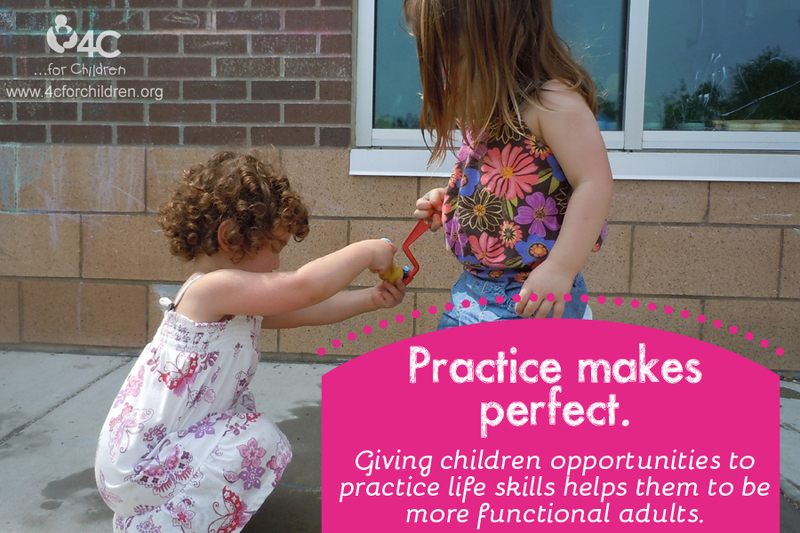 But we know that it’s developmentally appropriate for a child to learn to do these things for herself. It’s our job to let them feed themselves and then clean up the mess. Still worried about the parent with the dirty shirt? Communicating clearly and often with parents about the environment you are trying to create for the children in your care will help with their concerns. We want to view parents as members of our team, and as the member of the team who is the “professional,” it’s our job to let parents know why we do what we do. 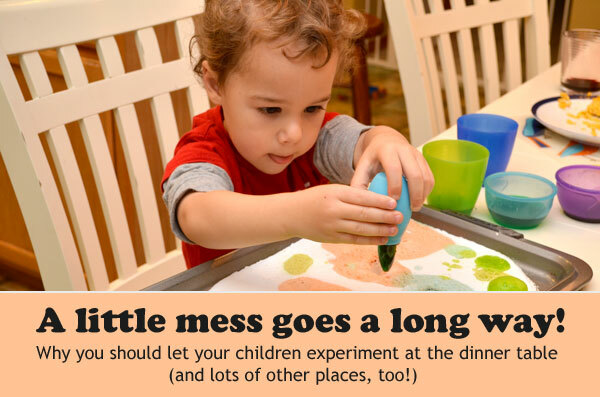 Let parents know that meal times (and other messy activities) are learning opportunities. During this time, young children interact with their child care providers and with each other, develop healthy habits, explore food (tastes, colors, smells), build motor and cognitive skills and enjoy a sense of caring and community. If all else fails, break out the bibs! This entry was posted in Advocating for Children, Best Practice, Early Childhood, Infants and Toddlers, Parents and tagged children, early childhood, families, infants, parents, teachers, toddlers on February 10, 2012 by 4cforchildren.